Old Man Logan #44, by Ed Brisson, Juan Ferreyra, and Cory Petit, continues Bullseye’s quest for revenge against Logan, and the body count is rising. Can Logan take down a more unhinged than ever Bullseye before more innocent people die? Ed Brisson has expertly turned Bullseye into Logan’s greatest obstacle in the last year. It’s a hero/villain combination that really hasn’t happened before, and it’s been a very entertaining one. 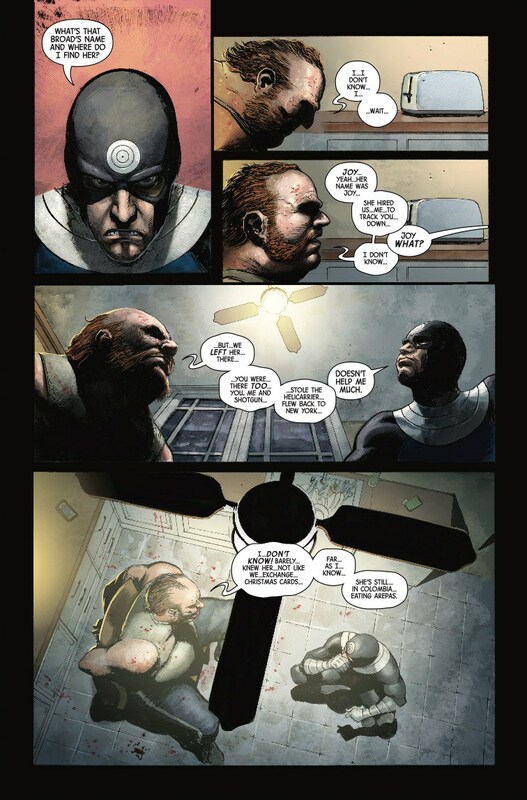 Bullseye interrogates Bullet, a mercenary that went after him in Bullseye: The Colombian Connection, about the identity of Joy Jones, the armored women who was helping Logan last issue. Bullet doesn’t know anything about her, so Bullseye threatens his son to get him to reveal the location of his partner, Shotgun. Logan and Joy, having escaped the explosives Bullseye planted last issue, plan their next moves, trying to figure out where to find Bullseye. Joy figures out that Bullseye is going after small timers who wronged him, and Logan and her race off to find Bullet. They make a deal with him and the chase begins. Brisson adds more bricks in the wall in this issue, getting more into Bullseye’s motives and what he’s been doing since the last time him and Logan clashed. Logan and Joy theorize that Bullseye has been killing the small timers who have wronged him in an effort to build up to people like himself and Daredevil, the big timers. Or it could be that he’s angry about losing to Logan. Or it could be that he’s crazy. Now, that seems like it’s not actually getting into his motives, but really, it’s all of those things. Bullseye is insane, but he’s not crazy. A crazy person is completely random. Bullseye can seem random, especially with his nonchalance about the innocent people that he kills, but this is a man for whom violence is reflexive. It’s how he deals with the world. The world is his canvas and violence is his paint. When it comes to his objectives, he’s brutally methodical. If his enemies think of him as insane, it keeps them off balance, and that benefits him. Brisson is getting into the psychology of the character in subtle ways, and it’s a joy to behold. Bullseye is the focus of this issue nearly entirely. It’s all about finding Bullseye, reacting to Bullseye, and stopping Bullseye. That’s both a good and bad thing. Bullseye is one of Marvel’s better street-level villains. Not only is he dangerous enough to give a lot of heroes a hard time, he’s the closest thing Marvel has to the Joker. Both Joker and Bullseye are violent thrill killers, but Bullseye brings a cold-edged reason to his actions that Joker lacks. Plus, Bullseye’s physicality makes him more of a physical threat to the heroes. Joker is unpredictable and full of rage, but he lacks the ability of Bullseye. The bad thing about it is that this isn’t Bullseye’s book, and it all becomes rather one-note after a while. Instead of Logan and Joy figuring out what his next move is, it shows readers what he’s doing, taking the surprise out of it. Bullseye brand of brutality has a visceral quality that doesn’t work as well when it’s shown in its entirety. This is pulled off nicely when Bullseye confronts Shotgun at the bank, but showing the interrogation scene of Bullet takes away from when Logan and Joy later arrive. Plus, Brisson hand waves away describing how Joy and Logan escaped the explosion of Bullseye’s agent’s office last issue, and that’s a bit annoying. Juan Ferreyra’s art is wonderful. It’s crisp and detailed. His action scenes are kinetic and well laid out. During the interrogation scene, he expertly uses shadows and light on Bullseye, shrouding him and revealing him. It’s a very dramatic effect and it works perfectly in the context of the scene. He’s also to capture the insanity of Bullseye perfectly throughout the book with his expressive character acting. He also draws a great Logan. 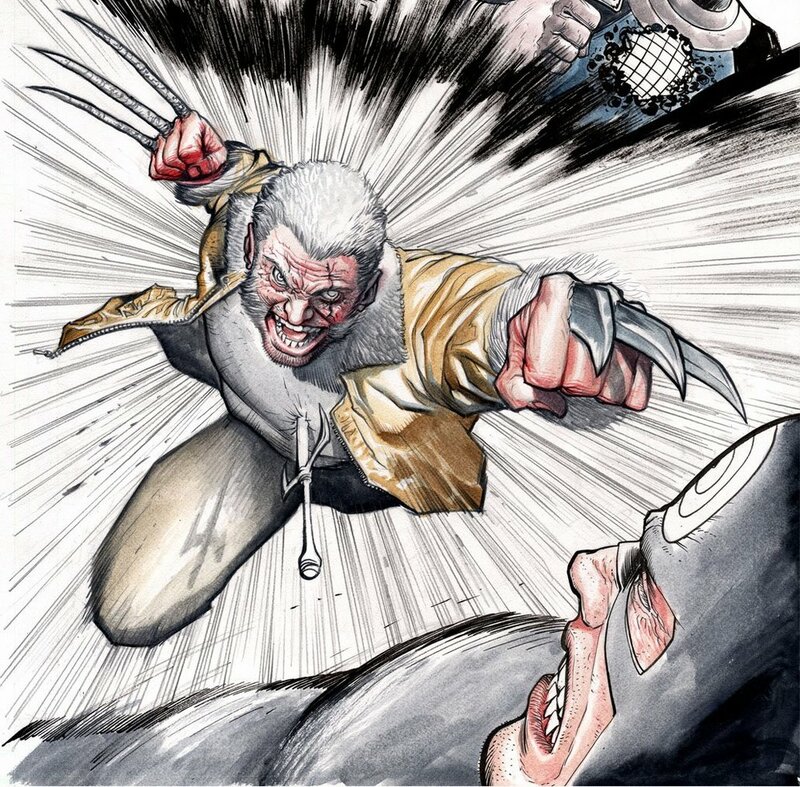 There’s a panel of Logan jumping into battle against Bullseye that’s classic. It captures the feral glee of Logan jumping into battle, and Ferreyra’s style makes it look amazing, a masterpiece of composition and color. Old Man Logan #44 is an entertaining book with a few minor drawbacks. There’s too much focus on Bullseye, which isn’t entirely a bad thing, but it takes away from the effects his actions could have had if readers were more in the dark about what he was doing. However, even with that weakness, it’s a well-paced, exciting comic that will leave fans clamoring for the next issue.